Mike Schafer has won an award for being one of the Top 10 Personal Injury Attorneys in Kentucky! This award was given to Mike by the National Academy of Personal Injury Attorneys (NAOPIA). Their primary goal is to discover and recognize the top 10 personal injury attorneys in each state for their hard work. 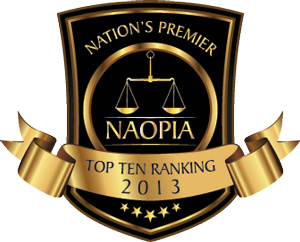 The attorneys who make the NAOPIA Top 10 list must first be nominated by a licensed practicing attorney, and then NAOPIA's research staff verifies that the attorney meets the minimum requirements of membership in the NAOPIA. Fifty of the nominated attorneys are chosen to advance to the final selection stage, and then their Board of Governors officially selects the Top 10. Congratulations to Mike Schafer of The Schafer Law Office for his hard work and making the community a better place!